In HCI, there is much interest in exploring novel technology-mediated communication that can empower older users who don’t have easy access to regular computers. 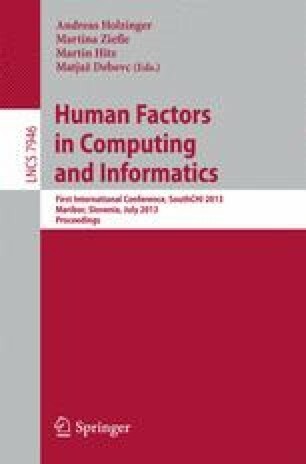 In this paper we exploit the potential of smart phones and tablet computers to create a series of technology probes that we deploy long-term making use of close family members. By this means participants can gain experiences with robust and fully implemented devices at a very early stage of design. We lay out four prototypes of communication technologies with different forms and functions for older adults. We describe the features of these devices including some indicative feedback from our informal deployment study. We thereby suggest that mobile phones are a suitable means for the rapid prototyping of communication technologies for senior people and can possibly provide useful input to later participatory or co-design activities. The overall work is still ongoing hence the main contribution of the paper is about the potential of rapid technology probes as a design technique and in less detail about the potential of the prototypes as AAL communication devices.